Synopsis: A man’s coerced confession to an IRA bombing he did not commit results in the imprisonment of his father as well. An English lawyer fights to free them. Although In the Name of the Father is, without doubt, a fine piece of film-making, the irony of a movie presented as a damning condemnation of the dishonesty of the British legal system which itself takes such liberties with the truth is inescapable, and ultimately serves only to weaken the undeniably shocking truth that four innocent people were kept in prison years after proof of their innocence was known to the police. While it’s true that there isn’t a film made that doesn’t use dramatic licence to bend the truth for narrative, creative or (at worst) commercial purposes, the filmmaker has some kind of duty to his audience, and a supposedly true story that strays so far from the truth is a dereliction of that duty. Of course, back in 1993, when most of us had never even heard of the internet, access to information wasn’t so widespread, and Jim Sheridan, the director and co-writer (with Terry George) of In the Name of the Father, might be forgiven for believing the liberties he took with the truth might not have been so easy to debunk. 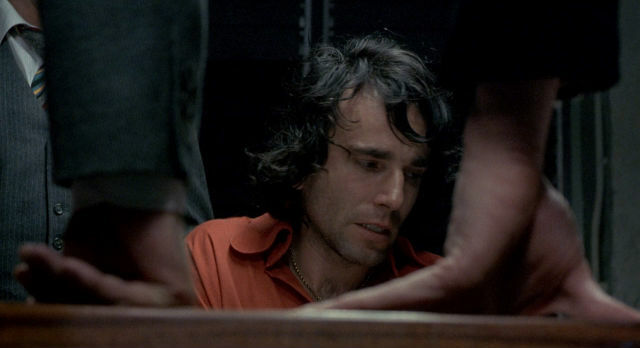 In the Name of the Father is the story of Belfast-based petty criminal Gerry Conlon (Daniel Day-Lewis – Gandhi, Gangs of New York) who finds himself fleeing from both the British army and the IRA when he inadvertently leads chasing squaddies through an arms cache and triggers a street riot after being mistaken for a sniper. Gerry’s antics eventually see him shipped off to Britain by his despairing father, Giuseppe (Pete Postlethwaite – Inception, Killing Bono). In London, Gerry and his friend Paul Hill (John Lynch) look set to continue their aimless existence, living in a squat and pursuing willing girls in the fag end of the free love era, while the opportunistic theft of £700 from a prostitute offers him the opportunity to return to Belfast claiming to have made a success of himself in London. However, the names of he and Paul are given to police by a fellow squatter after a pub bombing claims five lives, and the two young men find themselves the chief suspects of a force that seems more interested in bending the facts to fit their theories than finding the real culprits. Sheridan’s film paints a frightening portrait of the British police as a force of evil with no more regard for the law than the criminals they are supposed to bring to justice. 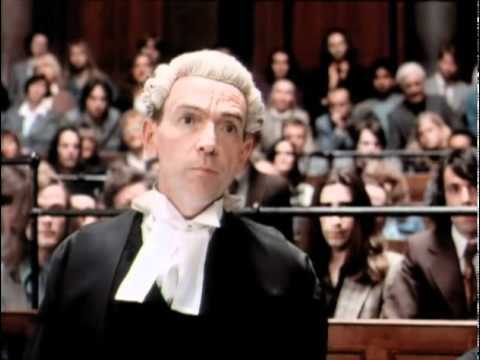 For the purposes of the film (which is heavily based on Gerry Conlon’s autobiography), Sheridan creates fictional characters in authority at which to point his finger, but such dramatic licence makes his condemnation no less potent. The facts of the torture of Conlon in order to extract a confession must rely entirely on his version of events, and so it seems odd that Sheridan devotes more time on the inhumane methods of the police at this point of the investigation (while downplaying the significance of the evidence they had) rather than on the verifiable reality of their concerted efforts to later hide the truth from the public once the reliability of the evidence upon which the convictions of Conlon, Hill and two others were based was proven to be unreliable. Of course, no man will confess to a crime he didn’t commit unless under extreme duress, and the questionable methods and ethics of various UK police forces in the mid-1970s (and beyond) are well documented, but Sheridan’s positioning Conlon in a crucifixion pose while being tortured is so manipulative of his audience’s motives as to be objectionable. In the Name of the Father is at its best when focusing on Conlon’s developing maturity through the evolving relationship with his father as they serve their unjust sentences together – although, even here, Sheridan takes liberties with the truth, as, rather than sharing a cell together, the two men spent most of their sentences in separate prisons. It’s Giuseppe Conlon for whom we feel most sympathy, and Pete Postlethwaite gives a performance of quiet dignity which complements Day-Lewis’s more dynamic and emotional – but no less effective – style. Together, the conviction of their performances allows the audience to share their outrage rather than merely observe it, and it’s because of this, rather than Sheridan’s questionable manipulation of reality, that In the Name of the Father succeeds as a piece of movie entertainment while failing dismally as a recreation of fact.